← Did Your Working Experience Prepare You For Retirement?? Tell Your Story!! Gary Pipher Shares His Story. Hubert Van Eerd of the Thames Horizon Club Reports their Summer Season Ends!! Hubert Van Eerd Speaks: Thames Horizon Shuffle Club ends summer season. 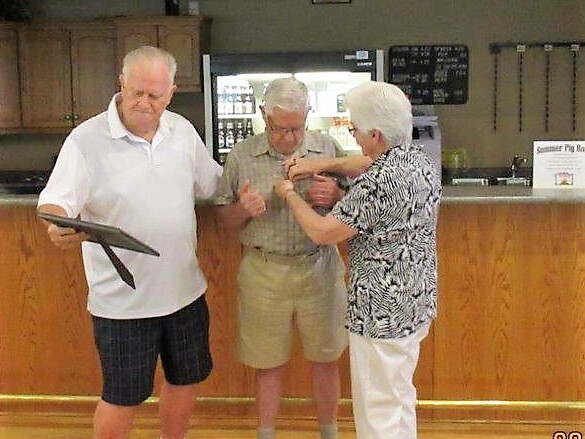 Stan Speaks: Hubert was recognized for his Significant Contribution to Shuffleboard this summer, 2018 08 08, when he was inducted into the OSA HOF. Pic on the right is of his Inductor, Glen Peltier, and Hubert’s wife Cathy pinning him. Hubert Speaks: Thames Horizon Shuffle Club completed the summer shuffle season on Sept 27/2018 with a barbeque for members and spouses. We had a very good season again at a very good facility, 8 regular indoor courts. During the season we played 17 league days plus 4 Mingles/Singles, all well attended, league play in the morning, Hoss Collar in the afternoon. 45 members showed up for the last day. A GOOD TIME WAS HAD BY ALL!!! Submitted by Hubert Van Eerd. 2018 09 27.